Passing along something Carl Steiniger posted on the HRWA group on Facebook. I'm completely confused about what's going on at Pier 40 now, there was an RFP, there was Cirque du Soleil, there was a local group, I don't know where everything landed - I guess I'll go find out tonight. I'm not quite as obsessive about what's going on in the Hudson River Park as I was when I kept my boats there, but I still have a ton of friends in the park so I care about what happens there. Will be there for silent moral support if nothing else. Just a reminder that Community Board 2 (Manhattan) will be hosting a Pier 40 Forum this Thursday, February 28th, at the Saatchi & Saatchi Building, located at 375 Hudson Street (between West Houston and King Streets). The Forum will begin at 6:30 p.m.There will be presentations regarding a number of income-generating proposals for Pier 40 and comments by many of our elected officials. If time allows, there will be a limited question and answer period. We hope you can attend. Or just another brick in the wall? Poor Baydog, just when I'm making my first excursion into eating innards at Tasty hand-pulled noodles Inc., he's having some sort of rough patch in his love affair with food - the sushi's not cutting it and the groundhog er Philly cheese steak, which seems about as close to the polar opposite of sushi as you can get, also isn't quite it. 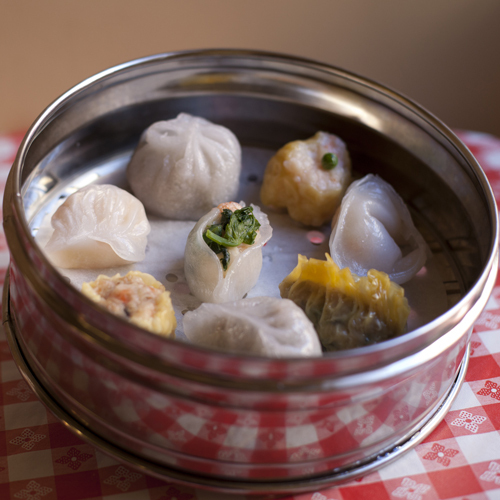 Maybe some nice dim sum? This was actually part of my February hundred-mile victory feast, and it was as good as it looks. If you read my Tuesday night post, you know that I went for walk that would have been great if I'd started, oh, an hour or so earlier; however, that did get me within easy striking distance of another 100-mile month, and when I looked at the map and discovered that a return to crooked little Doyers Street would be about a mile and a quarter, I instantly decided that I was going to go have dinner at Nom Wah,, a classic-looking old place that I'd noticed 2 doors past the noodle shop (and therefore one very hearty bowl of hand-pulled-noodle soup too late to try). It was the perfect foil to Monday night. It was a little on the dreary side, but it was short enough that it didn't matter, and I knew exactly where I was going, exactly how long it was going to take, and in fact, exactly what I was going to order when I got there - what could be better for a solo diner than an 8-piece dim sum sampler? That's what's shown above - I chickened out of taking a picture myself, because I was out in the middle of the room by myself and had the real camera along (one of the good bits of Monday's walk was the full moon rising next to WTC 1 and over the Winter Garden; the Winter Garden currently has an art installation of colorful lighted disks that appeared almost moon-sized, I brought the Lumix with thought that if it was clear on Tuesday night I might be able to get a picture -- it wasn't and I didn't) and it just seemed awfully conspicuous. Thing is, it turns out I didn't need to -- what they brought me looked EXACTLY like the picture above, which I took from their website! No food stylists with the primping and the makeup - that's genuine natural beauty there! Only concession for the website was the checkered tablecloth. This would have been a fine light supper in itself; I got self-indulgent and added a roast pork bun (which if I were in Hawaii I would describe as "onolicious" or maybe even "brok' da mouth! ", pretty close to my favorite manapua, and that's a good thing!) and the fried sesame balls with lotus paste. Wonderful. I'll be back. May skip dessert next time, you order everything at one go and my eyes turned out to be bigger than my stomach, and then I ate all three of the sesame balls anyways and there I was, on past perfectly comfortable to a little more stuffed than necessary. Next time, maybe just an almond cookie for the road. I did get a jar of their chile oil on the way out as a present for TQ, he loves spicy stuff and Nom Wah's looks like it might pack a good punch! As for Baydog - well, if all else fails, maybe a good dose of salt. Salt air and salt water. Not too long 'til Spring, right? Nobody Shakes It Like The Polar Bears Shake It!!! The rest of you Harlem Shakers, just lay down the funny hats, watch this, and bow to your betters! Let's hear it for the crazy and amazing Polar Bears of Coney Island and The Bronx. Faaaaabulous! Note on the 27th - Oh, and how appropriate that I've got dancing polar bears up on International Polar Bear Day. I'm changing the date of this post from yesterday to today. Happy Polar Bear Day to all! Lifted from this morning's Facebook status update - sort of explains the whole "NONgoal" thing I was cackling about back in January. 99 miles in February, one to go! Although last night's 11 and 3/4 mile walk was a good example of why I'm talking about "nongoals" with the walking. Having done 100 in January, naturally I had that in my head as a target for February, even though I'd promised myself that I wouldn't do that to myself - February is a shorter month, and we are beginning to get into the spring crunch at work and the last thing I need to do is inflict extra pressure on myself. Last night was a lovely night, though, and I'd been thinking that it might be a good night to wrap up another 100 mile month. I did another new walk, and a nice one (over to the Hudson from work, down around the Battery and then up along the East River to 57th street, then to 57th street and 7th ave to meet the Q train) but I started a little later than I should, I was tired enough that I got very aggravated by running into unannounced barriers on the East River Promenade and having to backtrack (I may actually be at 100 miles but the turnbacks aren't easy to spot on Google Maps) and then the Q train was doing the horribly annoying 2-section thing (see note at end) by the time I was riding home. This is why I don't want to start setting goals of 100 miles a month - the whole point is that I'm trying to up my activity level by doing things I enjoy, not ruin things I enjoy by obsessing over upping my activity. Note- Horribly annoying 2-section Q-train thing goes like this: Up until around midnight or so, I could have gotten on a Q train at 57th street and that train would have taken me straight home, fairly quickly. After midnight, the Q gets broken into 2 sections, one from 57th street to Atlantic Avenue (2nd stop in Brooklyn as you're coming from Manhattan and a very large station where a lot of subway lines converge and you can also switch to the Long Island Railroad) and another from a different platform at Atlantic Avenue on out to Coney Island. Pretty much automatically makes the time it takes to get home at least half again as long. They do it for track work, it's not like the MTA is actually trying to make late-night commuters unhappy, but it still makes late-night commuters unhappy. Parrotfish (uhu) with Christmas wrasse - two of my favorites. It's very very cold in NYC, the weekend's forecast is totally unsuitable for recreational boating so I'm looking forward to my first pool session in 2 years (!!!). It's going to be nice to work on my rolls in warm, clear, blue water ("yoga in a boat", I like to call it), but of course thoughts of warm, clear, blue water on cold winter days gets me thinking about the very best warm blues - the ones along the shores of O'ahu! Wish I could take a holiday there - especially now that I know that changes are coming to Haleiwa. At first I was afraid that that meant that I had missed my last chance to get shave ice at Aoki's when I decided to go hike among the honu (Hawaiian green sea turtles) instead of taking a shorter walk and then going back for my treat - thank goodness, it doesn't sound like this will be the end of Aoki's, but I will miss getting my shave ice at their classic old shop. Mahalo nui loa to dear Pua for sharing the news, and for talking me through the initial shock. It's funny, I half expect one or another my favorite places in Aiea to be gone every time I visit - but Aoki's? I'd have thought that whole little stretch of Haleiwa town would be in some sort of historic preservation district, safe from the wrecker's ball. It was really cold out, but I still talked myself into a bit of a post-work walk by promising to reward myself with a stop at Wonton Garden, a noodle shop on Mott Street that's open late and sees a fair amount of me during budget season. I'd actually been crushed last year when I was all set for a bowl of their good wonton soup with thin Cantonese noodles on night after work and made my way there only to discover they were apparently closed for good, but as it turned out, they were closed for a very long renovation (yay!). I hadn't been since I discovered they'd reopened and I though I'd go tonight. I didn't make it. On crooked little Doyers Street, a little over 2 miles into what ended up being a nice little 3-mile walk, I was brutally waylaid by Tasty hand-pulled noodles Inc.
Dont'cha hate it when that happens? I had the house special, which is hand-pulled noodle soup with beef, oxtail, tendon, tripe, and a fried egg. I was a little scared of the tripe but I figured I could pull it out if I didn't like it, and it turned out to be pretty good. I figure this is Consolation Prize #2 for the noodle soup with soy-glazed pork belly I missed out on. I certainly felt consoled after this meal. Big-time comfort food, oh my yes. Very tasty indeed. I'll make it back to Wonton Garden before too long - budget season and royalty review time are both coming up fast and there will be plenty of late nights to go visit my old favorite hole-in-the-wall -- although I don't know if I can call them a hole-in-the-wall anymore, they are looking kinda spiffy since the reno! Deep in the heart of BROOKLYN! Note: If you don't have time to read, scroll down, there are more pictures are at the end! So yesterday's chowderhound pictures were taken during one of my best rambles yet. I do still mean to do a post about how all of this "urban hiking" I've been doing is part of a Non-New-Year's Ir-resolution (short version: because the only New Year's resolution I ever kept was the one about never making another New Year's resolution again!) and why I made such a big deal about 100 miles being a NON-goal - but tonight I just want to share some pictures of yesterday's walk. This one was a little more planned out than most have been - I had a 3-day weekend to play with, with a 1:00 pm sea kayak committee meeting pretty much wiping out Sunday (good timing, with temperatures below freezing and winds that sounded like they were going to rip the roof off the club that was the one day of the weekend I really didn't want to be outside, I've toughened myself up because I think I'd go nuts if I stayed inside ALL winter but you know, there are LIMITS for this transplant from the tropics, and Sunday was way beyond those) and TQ unfortunately working on Saturday and Monday. Of those 2 days, Saturday was clearly the one to scratch the kayak itch, which I did (yay); Monday was looking like another excellent day for a long, long walk with Bella as long as I layered up for wind and cold. The interesting thing about walking with Bella as opposed to walking solo is that I lose the option to stop in a coffeeshop or jump on a bus if I get too cold, so I really did gear up pretty much exactly as though I were heading off for a hike in the woods - hiking boots, windbreaker over fleece and windpants over jeans, water for both of us, plus a good breakfast for me (kinda Hawaiian-style - ramen noodles with spam and an egg! :D) and a small extra helping of food for her (she gets breakfast early, before TQ leaves for work, I figured she'd need something to walk on too). We set out from Midwood a little after 10:30 and the great part was that we didn't have any particular time we needed to be back. Graffiti only a grinch could hate at the Midwood High Athletic Field. OK, probably principal-sanctioned, but it's nice, right? Marina near the north end of Plum Beach Channel We stopped here for our first water break. It's funny, this is an arm of Gerritsen Creek; I've paddled past this a dozen times or more but somehow never thought of turning in to explore. Of course in the summertime it's full of jetskis and motorboats, but so is the rest of the area. One less-pretty picture - Gerritsen Beach got absolutely hammered by Hurricane Sandy. Mostly the residents have done an amazing job of cleaning up but there's still evidence here and there. Lovely little bungalow court in Sheepshead Bay. Glad to see it looking ok after Sandy. I love these little courts - I think some of them have gone done to be replace by big glitzy condos with Miami-esque wave-styled rooflines and such, but if I had enough money to have a little place on the water and not have to worry about a storm taking it, I think I'd rather take someplace like this. Donna G, one of the Sheepshead Bay fishing fleet. I always find myself thinking it would be fun to go fishing on one of these boats when I walk through this area - haven't gotten around to it yet but there are a couple that are known as family-friendly (which I would hope to mean "women won't be made to feel like they're spoiling a boys' day out") and maybe one of these days I will get around to it. That, and paddling the Gowanus Canal with the Dredgers...good to have things to look forward to! Sheepshead Bay. The bay is named after a kind of fish, but if they ever wanted to rebrand it to appeal to the gentry they could call it Duckhead Bay. Or Swanhaven. But I'd be sad if they did. Back home in Midwood, just before sunset. Rough estimate of the day's route. A fine urban hike! More pictures from the day over on Flickr. 2. Eat up all the chowder by yourself. 3. Let the dog lick the empty container. The dog will be thrilled. Note: For sharing chowder with humans or cats, you might want to look elsewhere for hints. These instructions might not work as well with species who have a less liberal definition of "share". Alas, No Noodles. Made it a Paddle-My-Buns-Off Paddle instead! Oh, so sad! No more late night noodles and dumplings at Purple Yam - they said they tried for 3 weeks and it just wasn't flying :( . I have the worst timing - I went in when they first posted that deliriously delicious-looking shoyu-glazed pork-belly noodle soup, which was a week or two too early, then I waited until a week too late to try again. Still had a fine meal (tried the tamarind shrimp with rice cake, which was very good), and then as a consolation prize I got an order of Purple Yam's fabulous cua pao (steamed pork buns) to go. I had one for a late-night snack, and through some admirable self-restraint, there are 2 left for breakfast. Purple Yam's cua pao is a huge favorite of mine because it's about the closest thing to manapua I've found in this town, with the exception of the char siu bao at a Chinese bakery that shut down a month after a co-worker who also hailed from the islands introduced me to it, and one other little hole-in-the-wall bakery in Chinatown whose address I idiotically failed to note (I'd stumbled across it during one of my rambles). Funny thing is, almost every Chinese restaurant and bakery in the city serves steamed roast pork buns that resemble manapua - but there's something about the seasoning of the meat that's not right. I think they cook the char siu sweeter in Hawai'i or something (or maybe everything just tastes sweeter to me when I'm there), but whatever the case, Purple Yam's cua pao comes pretty close. The usual! I took this in Fairmount Park, somewhere near Philadelphia, on a great trip a couple of years ago to go see some Pirate Burlesque on the barkentine Gazela with Will and Elizabeth - what a great trip that was, and this has become my standard Valentine's Day picture 'cause I love it & it's perfect for my outdoorsy/watery theme. Yeah, working in children's publishing does have its good points sometimes! Thank you to Brian at A Movable Bridge for taking the picture - the first nice lunchtime surprise was running into him up in the cafeteria, and then as I was talking to him, Clifford came sneaking up behind me. Clifford's celebrating his 50th birthday this year - we kicked off the festivities last Fall, because it was in 1962 that Norman Bridwell first sent a set of his drawings to an editor who really took a shine to one of a little girl and a big red dog and suggested that that pair might make an interesting basis for a book of their own. Clifford the Big Red Dog came out in February 1963 and the big dog just got bigger and bigger from that point on. We've had balloons all week and today Clifford was up in the cafeteria handing out hugs and cupcakes! There's a lovely interview with Norman Bridwell in School Library Journal (I actually laughed out loud reading the story about his editor warning him "You know, we're not running a Norman Bridwell book club...") - and as long as I am going on and on about Clifford I will just add that my favorite thing so far from the celebration was when Mr. and Mrs. Bridwell and their daughter, Emily Elizabeth (yes, THE Emily Elizabeth!) came to visit last year. Norman gave a very nice talk for the staff here, and at the reception afterwards we all got signed copies of The Clifford Collection. I just LOVED that because as a fortysomething, dyed-in-the-wool bookworm, one of the first books I remember was the original Clifford. I suppose that I'm pretty good proof that one of the best ways to teach a kid to love to read is to read to that kid. I remember getting read bedtime stories every night (or poems, and with poems I always wanted one more, and my dad would always close with, "I'll tell you the story of Jack and Ory, and now my story's begun; I'll tell you another about his brother, and now my story is done! ", which drove me nuts because I never found out what EITHER of those stories were). In doing so, my folks actually taught me how to read without realizing that they were doing so; I don't recall it myself but the story they've told me was that they figured out that I was reading along when one night one of them mis-read something, and I corrected them. At first they thought maybe I'd just memorized the story, but then they tried me on something I was less familiar with and I read that too. I don't know if Clifford was one of the titles I learned on but I do remember Clifford, and another Bridwell classic, The Witch Next Door, as being early, early favorites. Funny thing about working here is that of course we're surrounded by Clifford all the time, but it's mostly the TV version and the Clifford I remember from "small-kid-time" was a much doggier sort of dog - like he didn't talk, and I was pretty sure I recalled him actually snarling at one point, and he was just generally a little less tidy in a way that I liked. I'd been thinking it would be fun to get my hands on a copy of the first one just to see whether I was remembering it right, but somehow never got around to it, so it was tons of fun to get this signed copy of the first 6 stories - turned out I was recalling correctly, and on top of that there's a great little intro section that includes the original drawing that started it all. Lots of fun. Happy Birthday Clifford! With the remnants of last weekend's blizzard still in evidence, there's certainly no mistaking the fact that it's still winter, but the days ARE getting longer (I do love it when I start seeing a bit of blue still left in the sky when I leave work at my usual hour of 6, and we are there! ), and the various Sebago committees are beginning to gather to plot out the season's fun (SailComm was last night, kayak & canoe committees this weekend), and before too much longer, our local ospreys will be starting their long flight back from their wintering grounds to the South. 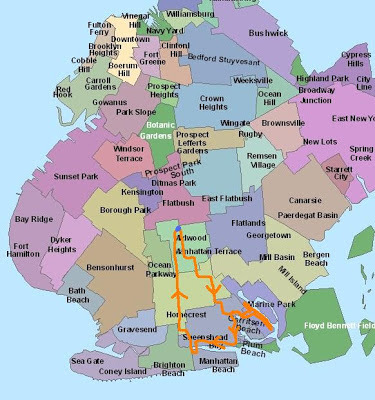 One of the ospreys that nests in the Jamaica Bay Wildlife Refuge (over in Broad Channel) has actually been tagged with a GPS tracker, and I'm really looking forward to following along on Osprey's Journey. Thanks to John at Control Geek for passing the word word word, word on the bird! Cross-posting at the Sebago Canoe Club blog. Why, yes. Yes, I do. The storm for me: Ohhh, I better leave work early. Ohhh, I better make some elk chili. Oh, la, how lovely is my neighborhood with an aesthetically pleasing 8 inches of pretty fluffy snow. PS - The TillerShovelman meme so far -- 'cause like the Maidenform woman, you never know where he'll turn up next! Oh Docker started it with one of his trademarked ode-ious posts. Next, Baydog chipped in with a little fashion critique (funny with the lift tickets - during the brief period in high school that I was doing a little skiing, the fashion among my friends was to leave the lift tickets on so everyone could tell at a glance how much you'd been skiing that winter). 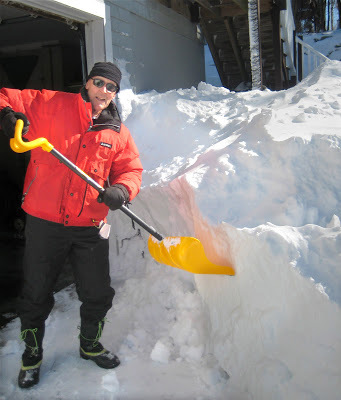 Next, the Shovelman shows up rescuing the Expedition to the End of the World and today the esteemed blogger's memeitude continues for at least another 15 minutes! What's that at 12:00, right on my nose? Why, I do believe that is a Seal of Approval for Steve the Paddling Chef! The weather during the end of the week last week was very shifty, leading to my decision to ditch my Tuesday night music last week in favor of wrapping up the 100 miles I'd realized I was pretty close to logging in January. As it turned out, I probably could have gotten in some miles on either or both Wednesday (when the rain that was supposed to start bucketing down around 6 held off until much later) or Thursday, which was cold but not as cold, I think, as the forecast had threatened, and again I think the wind came screaming in again later than expected, leaving another decent window for a walk right after work. Still, you know how it works - if I'd decided to gamble on the 30th or 31st offering decent walking conditions, they wouldn't have. It did pour on Wednesday, and the wind on Thursday ended up howling so loudly late late at night that I had a nightmare about my very solidly-built circa-1940's low-rise brick apartment was swaying and on the verge of collapse. I was SO glad to wake up - and when I did and heard the commotion outside, I knew why I'd dreamed that! 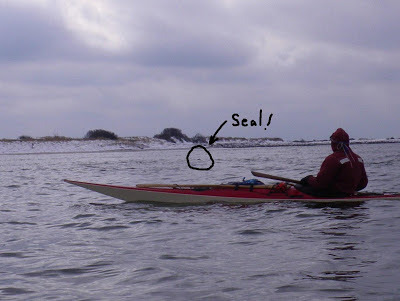 Tricky conditions for trip planning, but fortunately Steve had thought to start looking at the weekend and decided that Sunday might be worth another shot at a Jones Beach seal paddle & sent out the word among the winter paddlers that he was thinking that way. By Thursday, although the original forecasted temperature of 40 had dropped some, it was still looking like it would be above freezing - and the windspeeds were looking more and more cooperative for our purposes, so he made the call - it was a go! The plan was to meet at Jones Beach at 10, launching sometime around 11. We'd started out with 8 people coming but the predicted temperature did keep dropping. Saturday was bitterly cold (great day for the Outsider Art Fair I went to with a friend) by Saturday evening, we were down to the 5 of us who ended up going. Sunday morning was definitely on the nippy side, but it was nice and quiet and seemed like it was going to be a good day. This was the first time we'd used the roof rack and saddles since Sandy, when they were submerged in salt water during the flood - TQ had been too busy with his job out in Rockaway to have time for those, but I'd gone to the club for the big post-Sandy cleanup day and I took care of those and although TQ said the locks on the bars are a little sticky and need a shot of silicone lubricant, everything else was fine (hooray). We were a bit late to Jones Beach because it took us some extra time to set up the racks. We launched down near the Coast Guard station at the west end, near where we finished the club hike 2 weeks ago; I don't know about everybody else but I think I might vote for this launch for all future club trips - we usually launch at Field 10, which nobody can ever find without driving past it at least once. I was laughing this time, I swear this was the first time I have ever gone to Jones Beach, with TQ or anyone else, that we didn't end up doing an accidental trip the roundabout at the base of the Jones Beach tower. This one, you can actually see from the road. Here's the gang launching, minus only me and TQ of course - we were next on the water, we got there late but we're pretty efficient about getting on the water quickly. I probably would have tried to take some pictures of the birdwatchers that were there - it was chilly but there were a whole bunch of them there looking at a flock of little birds that I probably would have taken for sparrows if not for the bundled-up birders training their high-powered scopes at them. Turned out that they were snow buntings and horned larks and one single lark sparrow, which the birders were having a wonderful time trying to pick out from the rest. I was a little worried that we were going to scare the flock away, but one of the birders said we didn't have to worry, they would fly but they would circle back and land again the minute we were by. Would've loved to watch a bit more but our friends were waiting (plus it was awfully cold standing around)! Turned out Steve had never actually been out of the inlet, so that was what we did first. Quite the contrast to the heavy chop here last time! And then the wind died completely and the water went to flat calm, and the seals were everywhere. Practically perfect seal-watching conditions - a choppy day, those little heads are so hard to spot, a day like this, it's the easiest thing in the world. Wish we'd had this weather the weekend of the club's seal paddle! We pretty much stopped paddling and just looked at the seals looking at us until we started to get chilled enough that we decided to move on. Plenty of birds, too - none of the dovekies birder friend Mary told me to watch for (cute little birds, I would've loved to see them, and when I mentioned that to one of the birders who were watching the buntings and larks in the morning, she got very excited - "There are dovekies?" - I did explain that that was just what somebody had said we should watch for!) but we saw more loons, and I think a couple of long-tailed ducks, and mergansers kept surprising up when they'd suddenly pop into view right next to our boats. Lovely! Moving along now to warm up after we'd all gotten chilled during the drift, Steve suggested that we head just a little way into the marsh, just up to the little summer house in the picture above. He's taken to calling that "Bonnie's place", not because it is, but because boy, I do wish. You can keep your Cancun, you can keep your Cote D'Azur..it may not be Hawai'i but for someone who's settled here in NY, I just think that having a little place like this to go in the summertime would be heaven. Looks like they made it through Sandy OK. Nice to see. Stymied once again by the neoprene gloves, and on top of that my hands were officially freezing at this point - I actually thought the camera was having problems but when I looked closer back at the dock, I realized that I had just zoomed it all the way up to max (Optio W80 has a 5x optical zoom but then it goes on up to 30x plus digitally) and this was the sky! Oh well, I still enjoyed this last encounter. Waved goodbye to the seal and started paddling fast to warm up again. Next stop Bigelow's! I'd foregone this after the hike because there were a couple of people who were interested in being back at the club by a certain time, so us going back early let the carpool be more efficient, and I just didn't feel like I'd worked up enough of an appetite to do justice to a plate of Bigelow's lovely clam bellies. No such reservations this time! End of another fine day. Thanks again to Steve the Paddling Chef for pulling this together despite a very unsettled forecast - turned out great! I'm A New York City kayaking & sailing enthusiast. Finance analyst (or trying to be) by day - and somewhat by accident. Did someone say "river rat"? Why thank you, how sweet! Off-Season/Cold Water Boating Safety Sites - KNOW before you GO! Float Plans (as in plans to get you floating)! 25+ Ways to Get On the Water - Updated for 2012! Blogroll. Partial and preliminary. To be continued.